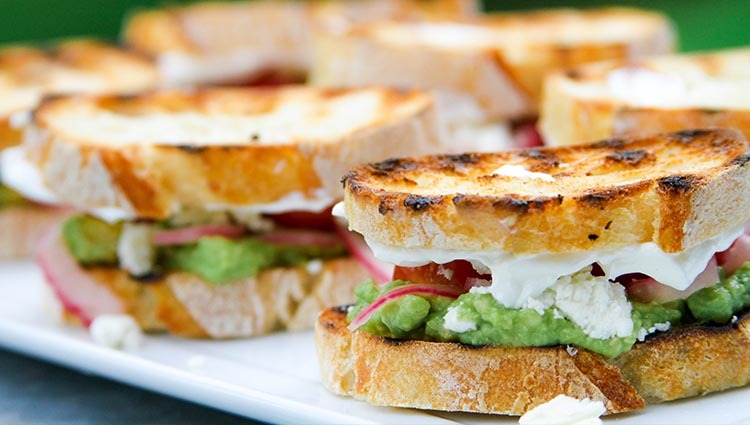 Grilled cheese loaded with feta, avocado, pickled red onion, diced tomatoes and Greek yogurt. Heat griddle or fry pan over medium heat. Scoop avocado into a small bowl. Add lemon zest, lemon juice, and olive oil to the bowl. Gently mash with a fork. To assemble the sandwich, lay 1 slice of bread on cutting board or work surface. Top slice of bread with avocado spread, pickled red onion, diced tomatoes, and feta. Slather Greek yogurt on second slice of bread and place on top of the feta. Repeat with remaining bread and ingredients. Melt butter in pan. Gently place sandwiches in pan starting with avocado side on the bottom. Grill until the edges turn golden brown. Carefully flip each sandwich and grill other side. (Greek yogurt helps keep the feta cheese in place). *To make the pickled red onions, place half a thinly sliced red onion in a bowl. Add 1 C apple cider vinegar and 3 T sugar. Let sit for 20 minutes. Drain and use.